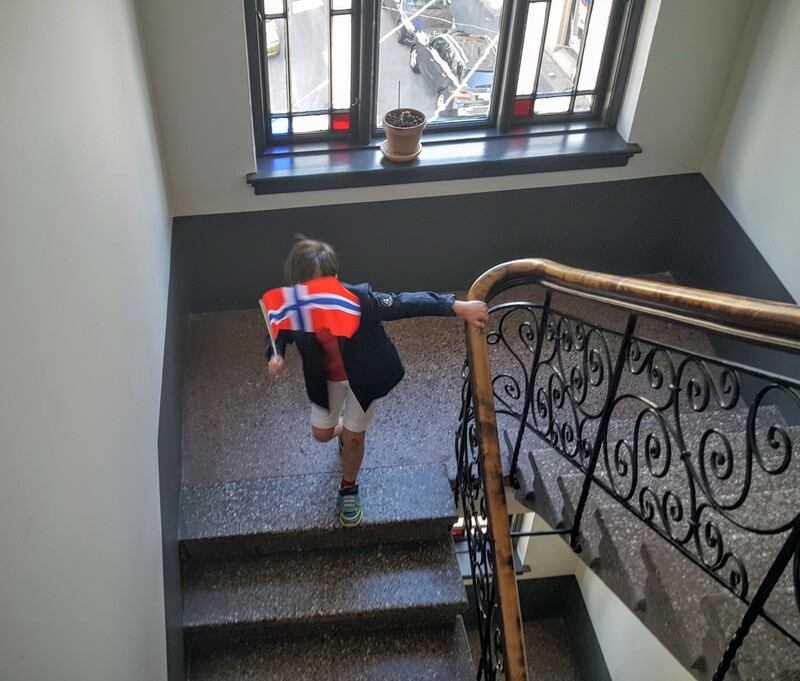 We are kind of a serial expat family and arrived last July in Oslo, Norway. 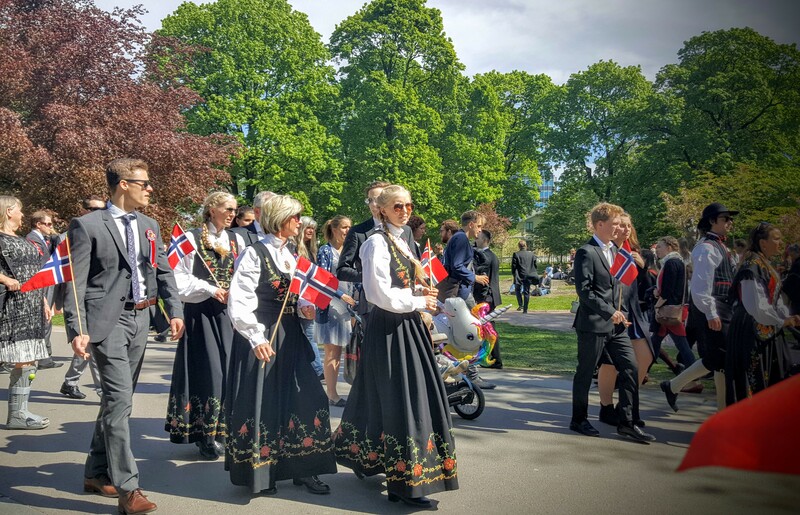 This is our first spring here and our first Syttende Mai: 17th May, Norway’s Constitution Day, the country’s national day. WOW we loved it! Unlike July 4th, 14 Juillet (Bastille Day) or Australia Day, you don’t see sweaty crowds wearing shorts, and thongs (flip flop) and carrying BBQ thongs in their backpacks! 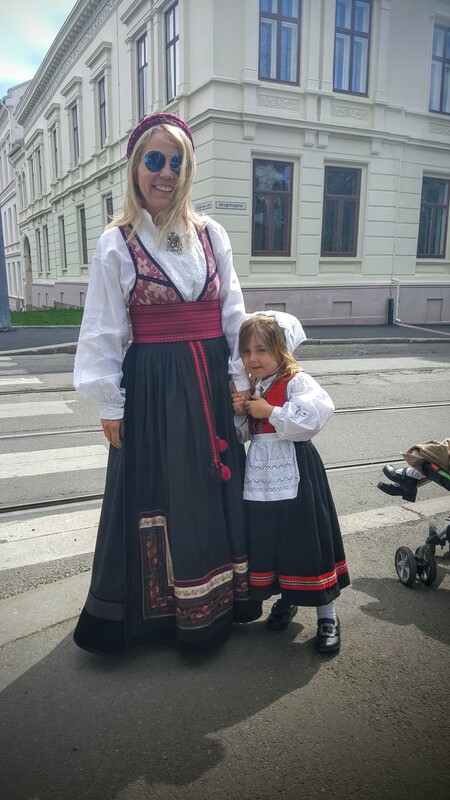 No No No, I was very impressed with how Norwegian dress up in the traditional Bunads. And if men aren’t wearing the 3 wool layered outfit that their ancestors were wearing back in the days, they would wear beautifully fitted business suits and a tie. Little kids were wearing Bunads too and that really is the cutest thing ever! 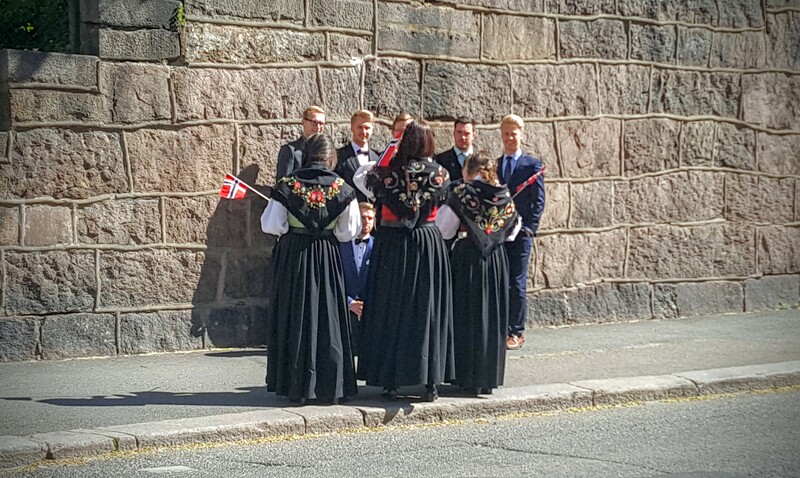 It was like everyone was dressed to attend weddings everywhere in the city. Or as my mum would put it: “Oh it’s just like our Tet Vietnamese/ Lunar New Year!”. 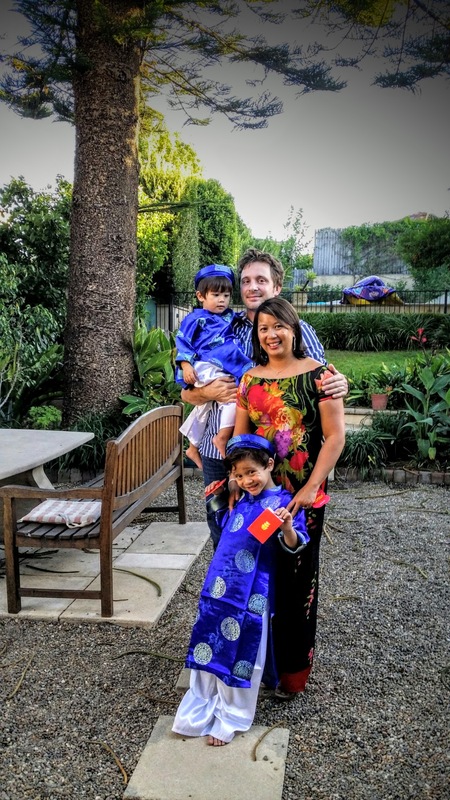 Never thought about that but there you go,two year old family picture back when we were still living in Sydney. 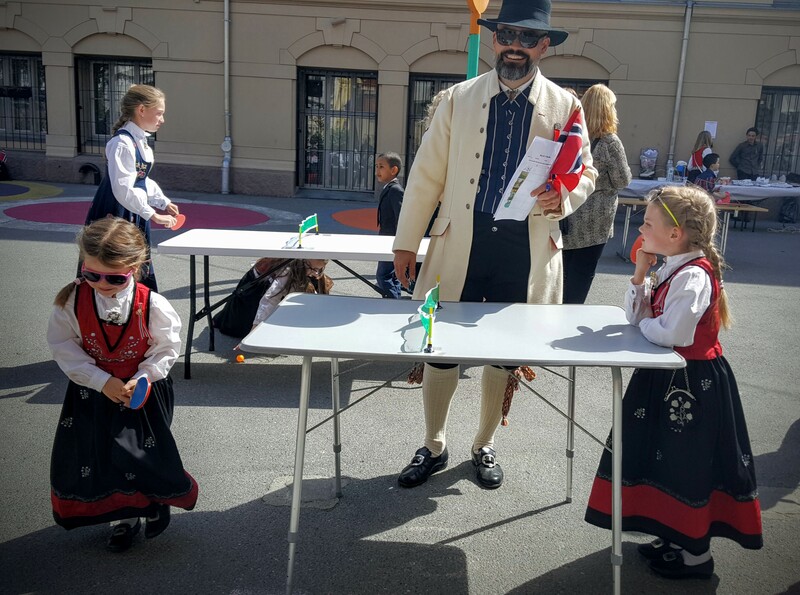 Back to our Norwegian National Day: it’s the day of the children. It’s not celebrating the country’s independence featuring a military parade with uniforms, tanks and jet planes like the French 14 Juillet. 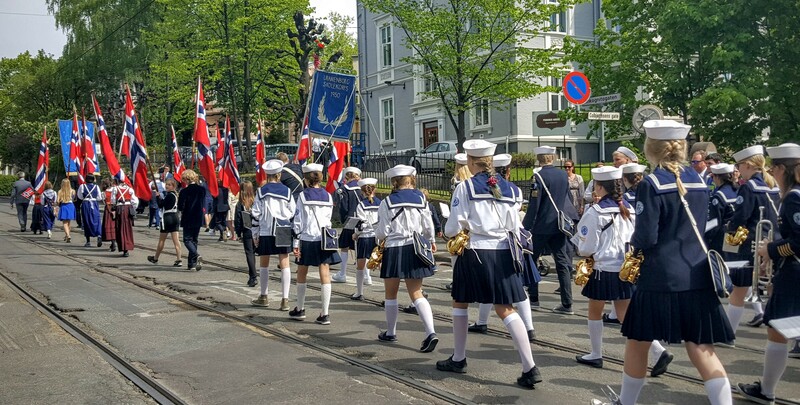 In Norway, the parade is performed by children walking with their schools’ marching bands. Just like Sechseläuten that we discovered in Zürich last year. It’s also the day when children should have fun and eat as many ice creams as they want! 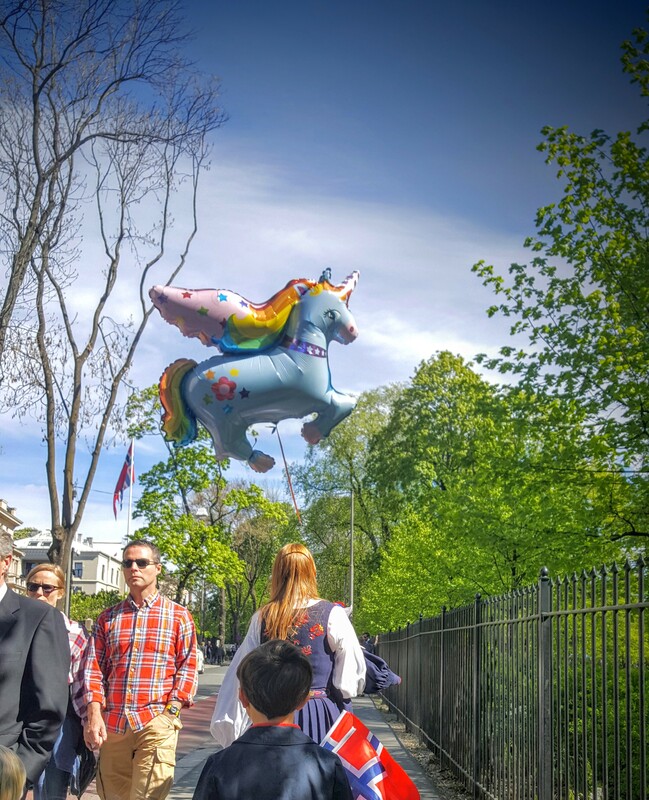 So at the Oslo International Hub, although is was gathering a crowd of international professionals, there was still a jumping castle in the back if the garden. At the French school, that’s when you run the “kermesse” or school fair with games for the kids. 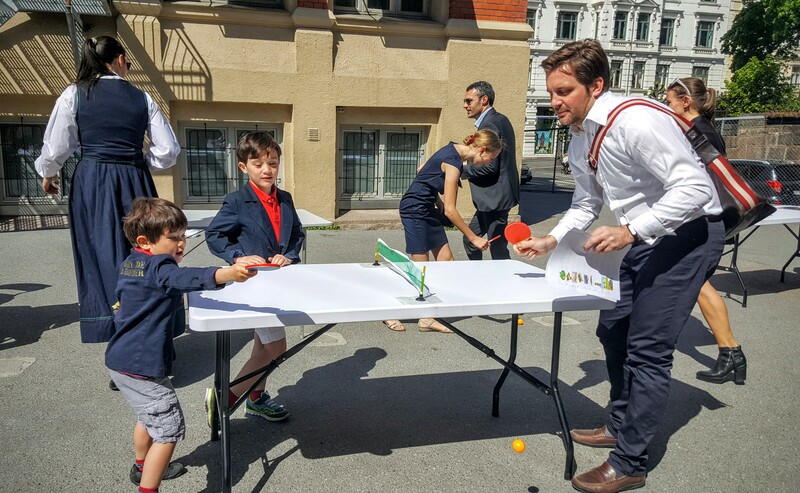 See how you can play ping pong in your bunad! Having no Bunads ourselves, we chose to wear navy blue jackets over something red and white. And my kids called it “Jackpot Day” as they bumped into so many Russ: they even got a golden card! Love this pic with a mix of crazy Russ, suited up people and peaceful older ladies in their traditional outfits. Garden parties everywhere. 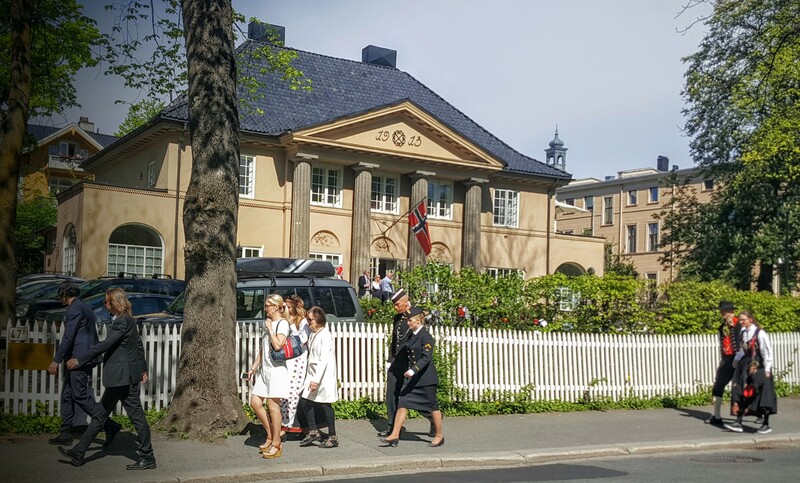 Norwegian usually start the day with champagne breakfast and keep drinking all day long, through to the night. 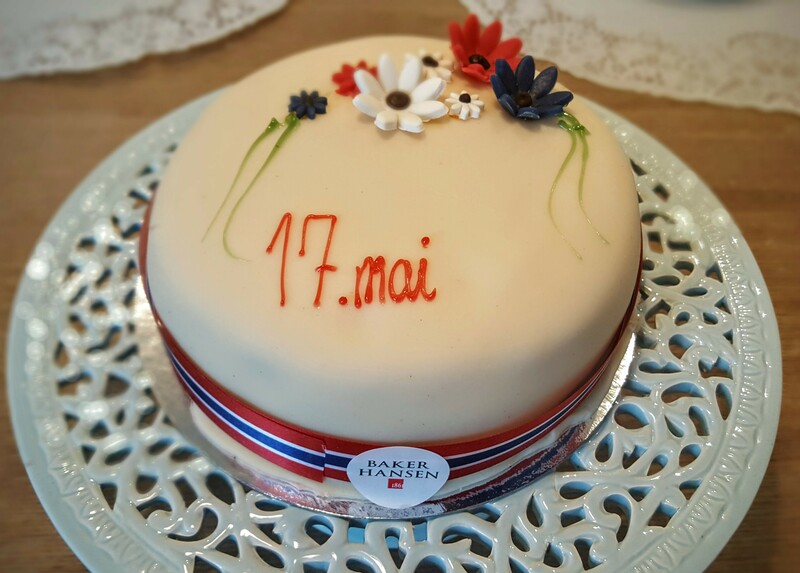 What did we eat on 17th May in Norway? Can’t overlook the food part in this blog right? 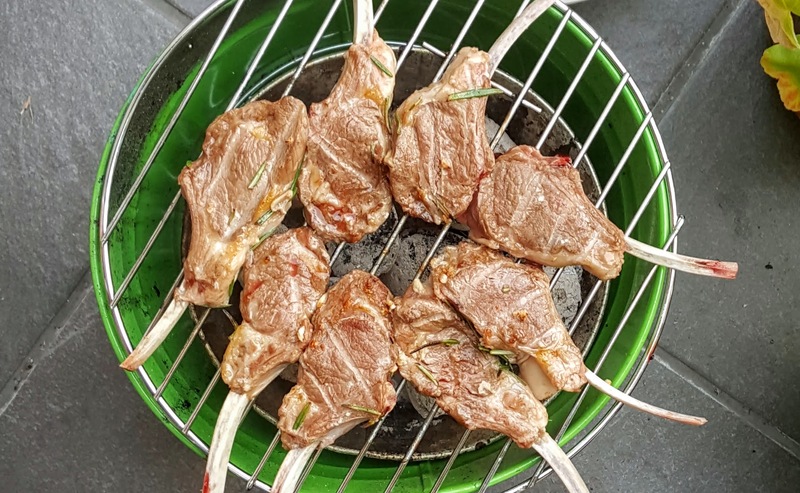 Well we had lamb cutlets grilled in our “bucket” charcoal BBQ. Hey, can’t break a 11 year long Aussie habit right? And for dessert we ordered a very French looking cake! Having learned how to make decorated cakes with fondant icing from Planet Cake, the best decorated cake shop in Sydney, my husband and I immediately spotted they had done a poor job with this one. And how tacky is the writing! However… it tasted amazing! Why? Because it was not sugar icing. It was a very thin layer of marzipan so it was light and had that delicious almond flavour and was moist, unlike sugar icing. 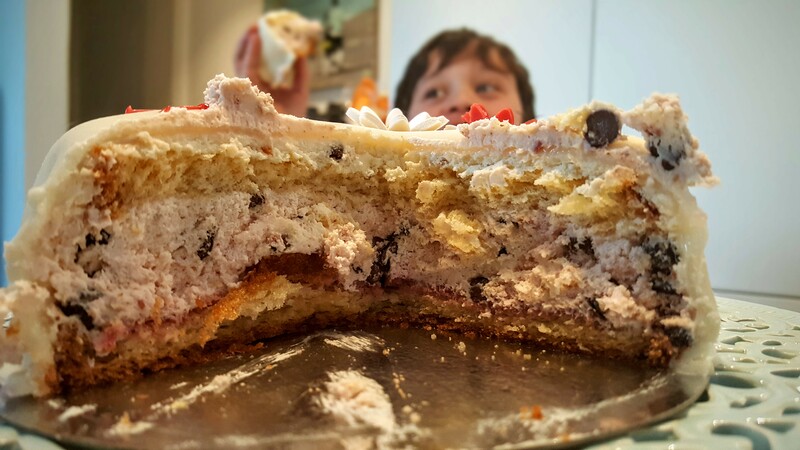 Inside was a mousse of raspberry with chocolate chips between two layers of soft and moist sponge cake. YUM! WHat a great texture combination! I wasn’t expecting this at all and I highly recommend it, from Baker Hansen from 300Kr. 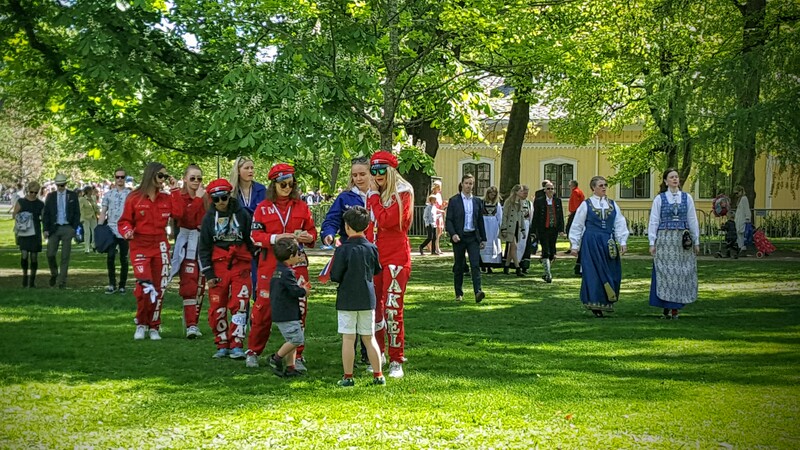 Previous article Norway’s Russ tradition: overalls, cards and parties!